Just last week, I picked up this neat Holiday Inns 1962 Summer Directory! Let’s see what it tells us about that iconic motel chain and which Holiday Inns Roadtrip-'62 ™ could have visited in our favorite year. Kemmons Wilson had the idea for Holiday Inns because of the frustrations he suffered on a family vacation from Memphis, Tennessee to Washington, D.C. in 1951. He found most accommodations to be cramped, uncomfortable, and expensive because they usually charged extra for each child. He measured and cataloged each motel along the way and came back with his idea of the perfect motel. He figured he would need to build 400 motels across the country, each just a day’s drive from another. He got started in his home city, opening four by the end of 1953, one on each main highway leading into Memphis. 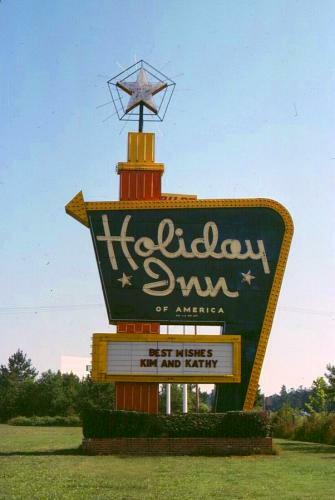 By 1962, Holiday Inns was undergoing major expansions nationwide, opening at the rate of two new motels every week! Among the inns that were opened in 1962 was one in my hometown of Saginaw, Michigan. The chain appears to have been making a push into Michigan, as they were also opening new inns in Jackson and two in the Detroit area that year. The Saginaw inn followed their pattern of partnering with the Gulf Oil Company, including a new Gulf service station adjacent to the motel. Another feature of that partnership was that anyone with a Gulf credit card could charge their Holiday Inn stay to it. Unlike many Holiday Inns of that period, the Saginaw motel is still open, having been extensively remodeled in recent years and rebranded as the Davenport Inn. Holiday Inns also published a magazine for guests, the Holiday Inn Magazine. 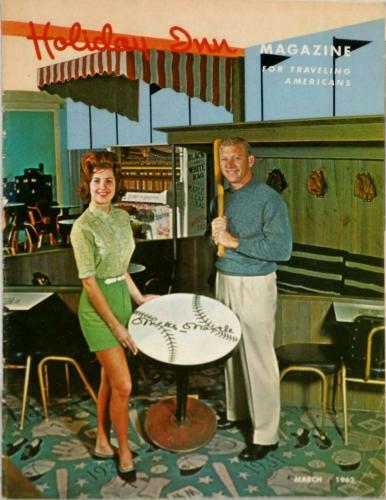 The cover of the March issue pictured baseball star Mickey Mantle, who also was the owner of a Holiday Inn. Several inns were part owned by celebrities hoping to cash in on their names. Mickey Mantle opened a Holiday Inn in Joplin, Missouri in 1962. At one time, the sign out front advertised, “See the Dugout and Mickey’s Trophies”. The Dugout was the name of the cocktail lounge / restaurant. The magazine has an article about the 2nd annual baseball player's party, which was held at this inn, complete with photos of Mantle, teammate Roger Maris, and other big league players. As you might expect, the magazine is just one a variety of memorabilia for sale from that motel featuring Mickey Mantle’s name and image. The company was on such a roll in 1962 that they expanded briefly into other ventures, including Holiday Inn Records. The label was set up in the company’s hometown of Memphis in 1961. It released records during the years 1961-1962 by acts including The Rollercoasters, Jimmy Foster, Frank Starr, Kenny Lund, Rusty Curry, and Stan Daniels. After disappearing for a few years, the record label came back during 1968-1969 with different artists, including one whose name fit perfectly, Dolly Holiday. None of the records charted very high. Perhaps the most remembered artifact from Holiday Inn’s older motels is The Great Sign”. This is the name the company gave to its gigantic, lighted roadside signs used during the original era of expansion from the 1950s to the 1970s. The signs could not be missed from the highway: they were 50 feet tall, included neon, chase lights, and a lighted star on top. Owner Kemmons Wilson loved the "Great Sign" so much that it was engraved on his tombstone. Though the majority of the signs were sold as scrap metal, a beautiful example is preserved at the Ford Museum in Dearborn, Michigan, another is at the National Save the Neon Signs Museum in Minot, North Dakota and one is outdoors at the American Sign Museum in Cincinnati, Ohio. So, just what Holiday Inns could we have stayed at along our US-23 or US-6 roadtrips? According to the directory, the following inns were open for at least part of the year in 1962. Most of them have been demolished, so we could not make the trip using Holiday Inns. And, as the following list shows, there were almost no Holiday Inns west of the Missouri River in 1962. The chain had not yet expanded much in the west. Anyway, that’s all for today. Please join me soon for news and more fun from 1962, on Roadtrip-'62 ™.